For the 24 hours to 23:00 GMT, the USD marginally declined against the CAD and closed at 1.3095 on Friday. Macroeconomic data showed that Canada’s consumer price index (CPI) jumped to its highest level in more than two-years, after it advanced more-than-anticipated by 2.1% on an annual basis in January, amidst a surge in gasoline prices and boosted by new carbon taxes in Alberta and Ontario. Markets expected the CPI to increase 1.6%, compared to a 1.5% rise in the previous month. Meanwhile, on a monthly basis, Canada’s CPI surpassed expectations and rose by 0.9% last month. In the Asian session, at GMT0400, the pair is trading at 1.3099, with the USD trading a tad higher against the CAD from Friday’s close. 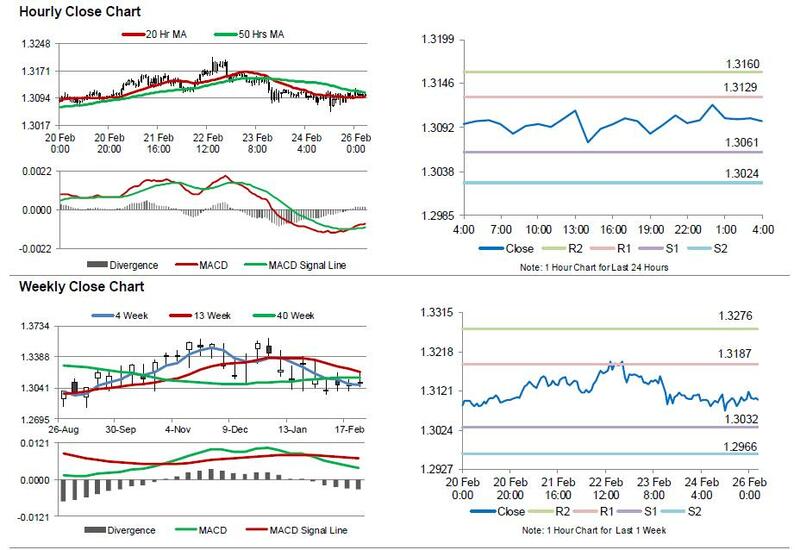 The pair is expected to find support at 1.3061, and a fall through could take it to the next support level of 1.3024. The pair is expected to find its first resistance at 1.3129, and a rise through could take it to the next resistance level of 1.3160.